Early morning volume was on the light side util the indexes took out the early range. All had good range expansion DOWN with the exception of the Nazdaq. This will be the index to watch on Wednesday for confirmation/non confirmation. 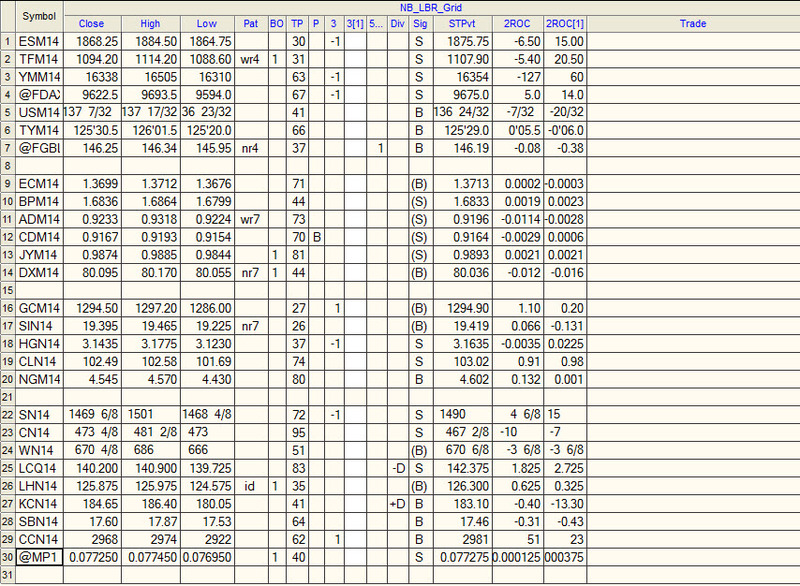 This was the first flip down on the 2-period ROC> Odds favor a trade below Tuesdays lows. The 30 minute charts support this. Bit picture, the SPs are still in an hourly coil (cash chart shown below) As one astute member pointed out, the ADX reading on the daily Cash SP chart is at one of the lowest readings in three decades. The Aussie Dollar broke and the weekly charts have sell divergences that suggest potential for a sustainable trend down. The daily swing low is the main pivot for the next week. (DA6M4 is the CQG symbol for the AD CME futures). Crude continues its trend mode up – (extended run). Swing highs are magnets and the uptrending channel line suggests the possibility of a trade above 104. However, it has had 3 days low to high and may need a bit of consolidation before punching through. Corn and Wheat are on an extended run to the downside. Bonds and Bunds are on Pinball Buy from Tuesday. The commercials got massively short the Bonds on this last push UP. However, the ten years are the real market to watch as they remain steady bid. 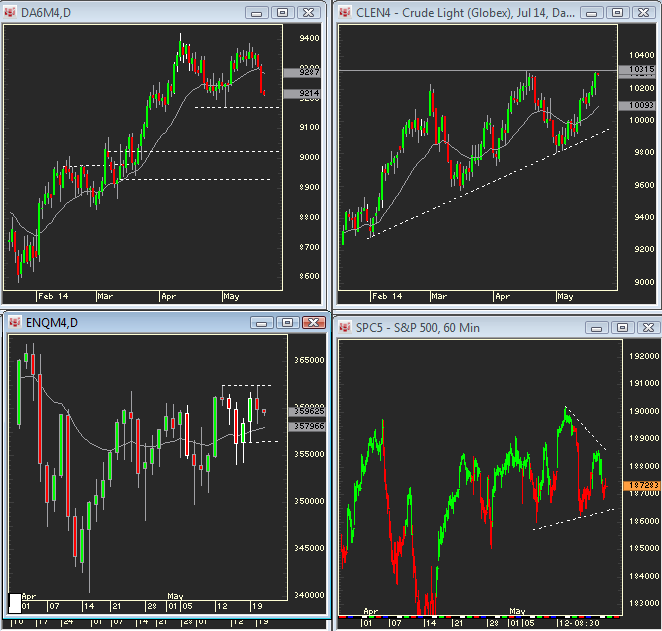 The weekly indexes have potential for better Sell signals. Watch the Nasdaq for confirmation.